This best seller has been revised and further enhanced. 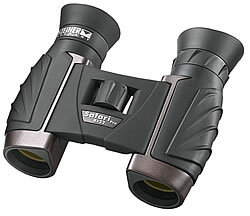 Better grip from the improved rubber casing and ergonomic eye cups make the handling of these binoculars even more pleasant. When folded they are not much bigger than a packet of paper hankerchiefs, so these binoculars can be stored anywhere, in a coat pocket or in the glove compartment. Thousands of satisfied customers have chosen the 8x22. The fast close focus compliments these small, lightweight, rugged glasses. The High-Contrast Optics offer excellent visual experiences at a very reasonable price. Bright and sharp images, whether under the glaring sun while you are on vacation, at the onset of twilight, at an open-air concert, or in the mountains during the observation of nature and animals. High-Contrast Optics are optimally suited for beginners and impassioned hobby observers!